Most arguments you encounter contain enthymemes which are unstated premises of arguments. It's important to know how to make them explicit so you can evaluate them. You can't evaluate what you can't see! This section introduces a new concept so you should pay careful attention. The previous sentence is actually an argument. Let's see why: First, I'm trying to convince you of something: You should pay careful attention. I also have given you a reason to believe you should pay attention: This section introduces a new concept. (P1). This section introduces a new concept. (C). Therefore, you should pay careful attention. If a new topic is introduced than you should pay careful attention. (P1). This section contains a new concept. (P2). If a section contains a new concept then you should pay careful attention. Notice two important things. First of all, we've taken what was an inductive argument and made it a valid deductive argument which means we can now evaluate it for soundness. That is, we can now evaluate all of the arguments premises for acceptability—not just the stated ones. Identifying enthymemes is absolutely vital for critical thinking because very often the enthymeme is a false premise. However, if we never make the hidden premise explicit, we can't make the evaluation. This means we might end up thinking a bad argument is good. One last note on enthymemes: When you add the hidden premise to the argument it becomes a deductive argument which means that when we diagram the argument, the premises will be linked. All deductive arguments have linked premises. Before we learn the method for finding hidden premises we have to travel back in time…way back to elementary school. Finding enthymemes require understanding the different parts of sentences. E.g. 1: The chair is black. E.g. 2: Today is lovely. E.g. 3: Critical thinking helps me think more clearly. E.g. 4: The judo club practices every Monday, Wednesday, and Saturday. E.g. 5: The right to self-medicate follows from the concept of informed consent. Next we need to be able to identify the subject: The subject is what proposition is about. It answers the question who? what? which? where? when? In English the subject of a proposition generally comes before the verb. The subject is in italics. E.g.4: The judo club practices every Monday, Wednesday, and Saturday. Last we need to be able to identify the predicate: The predicate is everything that isn't the subject. It's the part of the proposition that gives us information about the subject. I've underlined the predicates below. Let's work though and example to see how to identify hidden premises. Example 1: Since vaccines contain formaldehyde, you shouldn't put them into your body. (C). Therefore, you shouldn't put them into your body. Notice that the predicate of the premise is a statement about the what vaccines contain. But logically, on its own, merely knowing a what a vaccine contains doesn't automatically tell us whether or not we should put it into our body. If order to draw any conclusions I'd have to know something about how formaldehyde affects human health. Since there's no necessary logical connection between "containing formaldehyde" and "being something you shouldn't put into your body" we're going to have to supply the connection ourselves by creating the hidden premise. 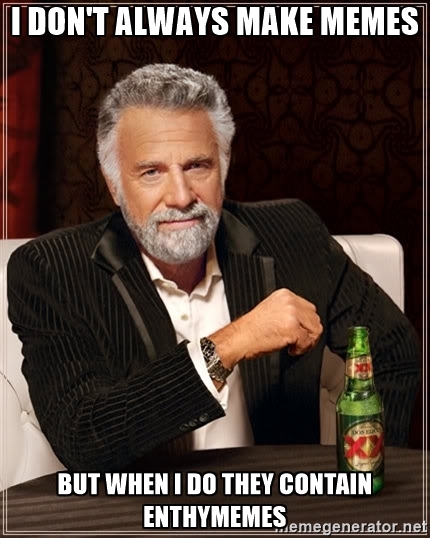 Step Two: Take the enthymeme out of our thumos (i.e., mind) and make it explicit. For the argument to be valid we need a premise that connects the idea of "containing formaldehyde" and "what we should put it in our body." In technical terms, we need to connect the predicate of the premise to the predicate of the conclusion. I connect them with an if-then statement (i.e., a conditional). The predicate of the premise follows the "if" and the predicate of the conclusion follows the "then". If something has formaldehyde then I shouldn't put it in my body. How did I know how to do that? (a) Underline the predicate of the premise and the conclusion. (C). Therefore, you shouldn't put them in your body. (b) Link the predicate in the premise to the predicate in the conclusion with an if-then statement and generalize the subject. We generalize subjects by replacing the subject of the premise with either "someone", "something", "somehow", "sometime", "somewhere". So, the subject of (P1) is "vaccines". We generalize "vaccines" to "something". E.g., If [vaccines something contains formaldehyde] then [you shouldn't put it in your body]. Step Three: Add the enthymeme to the argument. Notice that this makes the argument valid. Adding an enthymeme to any inductive argument turns it into a valid deductive argument. That also means that if you diagram the argument the two premises will be linked. (P2). If something contains formaldehyde you shouldn't put it in your body. (C). Therefore, you shouldn't put vaccines into your body. Step Four: Evaluate the argument for soundness. Now that you know that the argument is valid you should evaluate it for soundness. Is (P2). acceptable? It turns out that just like every. single. chemical. in the universe, the dose makes the poison. Small amounts of formaldehyde are absolutely harmless. 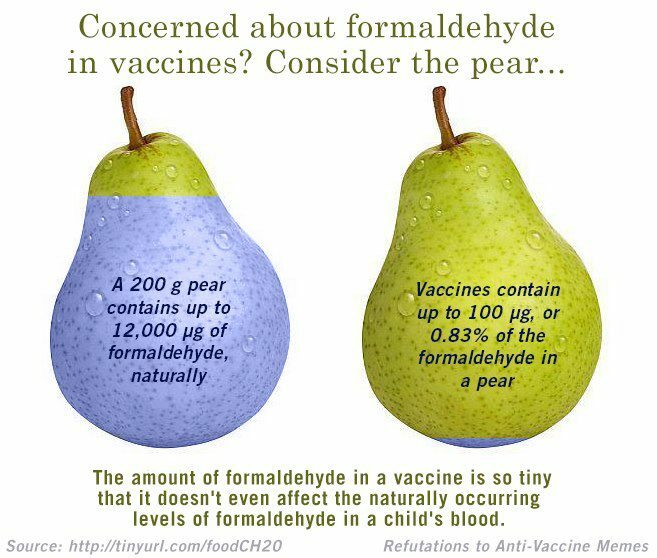 In fact, many fruits contain up to several hundred times more formaldehyde than vaccines. And so, without knowing how much formaldehyde is in a vaccine and the dosage at which it's toxic, we can say (P2). is questionable. A little google-fu reveals that the amount of formaldehyde in vaccines is insignificant in terms of toxicity and that most foods that we regularly eat contain much more. With this new information, (P2). is unacceptable and so the argument fails because it relies on a false premise. Step Five: Argument Jiu Jitsu, and Reductio Arguments. A reductio ad absurdum (normally just called 'reductio') argument means "reduced to absurdity". A reductio argument is a method of counterargument where you accept your opponents premises as true (even if they aren't) then show that they lead to either a contradiction or a ridiculous conclusion. Very often the enthymeme will allow us to do this. Let's see if we can do it with the above vaccine argument. (P2). states that "if something contains formaldehyde then we shouldn't put it in our body." To construct our reductio, we say to our opponent, "ok, I'm going to accept that as true and show you what else follows from it." The above meme with the pear shows that if we accept (P2). as true, then we shouldn't eat pears either. It turns out that most common foods contain formaldehyde (meats, fruits, vegetables) and so accepting (P2) as true implies that we shouldn't eat most foods.2 Clearly this is a ridiculous conclusion. By creating a reductio argument we've shown our opponent that even if they insist that (P2) is true, it leads to ridiculous consequences and so we should still reject their argument. We took our opponents own argument and turned it against them. And that's argument jiu jitsu! Hai YA! Recall that we want to defeat the strongest version of our opponent's argument. If we defeat a straw man or a weak version, they can always come back and say, "Oh, yeah! What about this!" But if we defeat the strongest possible version of their argument, there's nothing left for them to come back with except tears. Argument: Ami's a philosopher so he likes beer. (P2). If someone is a philosopher then they (definitely) like beer. (C). Therefore, Ami definitely likes beer. (P2) is going to be really hard to defend if it's stated as an absolute rule. You'll always be able to find a few philosophers out of tens of thousands who don't like beer and that would show (P2) to be false. A charitable interpretation will maintain the spirit of the argument and allow for a small number of exceptions. (P2). If someone is a philosopher then they most likely like beer. (C). Therefore, Ami most likely likes beer. This captures the spirit of the argument and doesn't cause it to be defeated by trivial counterexamples. Notice also that to preserve validity the qualifier in the hidden premise must match the qualifier in the conclusion. In other words, if you have qualifiers such as "likely", 70% of", "most", "some", etc… in the hidden premise, the same qualifier should also be in the conclusion. If I don't keep the qualifier the same, the argument is no longer valid. The argument is no longer valid because now the premises don't logically guarantee the truth of the conclusion. Mike is a young man therefore he'll cause more accidents than other population groups. Since he'll cause more accidents he should pay more drivers' insurance. (P1). Mike is a young man. (P2). If someone is a young man they will cause more accidents. (P3). Therefore, Mike will cause more accidents than other populations groups. (C). Therefore Mike should pay more for drivers' insurance. (P2). If someone is a young man they are more likely to cause more accidents. (P3). Therefore, Mike is more likely to cause more accidents than other population groups. Pull out the hidden premise and make the argument valid by connecting the predicates of the premise and the conclusion with an if-then statement. After making the argument valid, evaluate it for soundness. Even if your opponent's hidden premise is acceptable, try to construct a reductio to defeat their argument. Fun fact: All memes contain enthymemes! 1. enthymeme, hidden premise, hidden assumption, suppressed premise all mean the same thing.